Libby's Little Addiction: March 2018 My Monthly Hero - Release Blog Hop + Giveaway! March 2018 My Monthly Hero - Release Blog Hop + Giveaway! Hello and welcome! Today I'm joining Hero Arts for the release of the March My Monthly Hero kit! This kit goes back to the basics, and does a beautiful job along the way. The kit is chock-full of useful supplies, but my favorite are the word dies included in the kit. They are absolutely swoon-worthy! 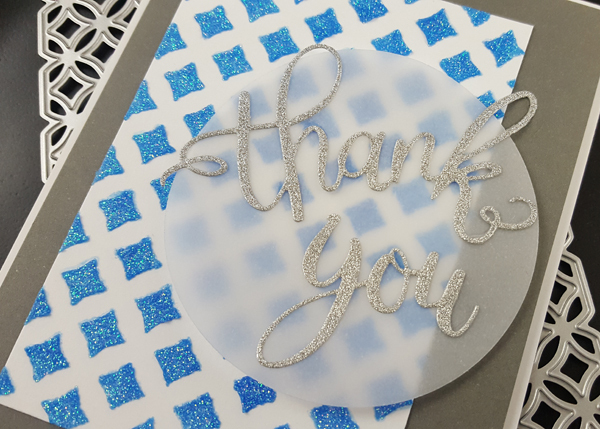 For my first card today, I die cut the "thank you" words in a silver glitter paper. For the background, I turned to the new background die that's an optional add-on this month - Bold Graphic Confetti Die. I die cut it with heavy cardstock, and in turn used the cut as a stencil. For the beautiful blue glittery embossing paste, I added a couple drops of Indigo Liquid Watercolor to some Moonstone Nuvo Glimmer Paste. I love how you can color the paste and make any sort of shimmer you need! I had a bit of a hard time photographing all the shimmer on this card, but here's a closer look. For this next card, I took the makeshift "stencil" I had used above, and turned it into another card! The coverage wasn't 100% perfect since it wasn't meant to be used initially, but I love putting those scraps to good use! I mounted the die cut on some paper from the Midnight pack, and then added just the "thanks" die cut in white. The "you" is a stamp in the kit, cut out with another kit die. I used Soft Granite ink on this. This next card is a quick and simple one that uses the diamond-shaped die from the kit. The die is sized to cut out some words in the clear set, but I used it on its own. Some of the diamonds are from glitter paper, and some are from a panel I embossed with the Silver Sparkle embossing powder included in the kit. The sweet little "hugs" message finished it. My final card goes in a different direction! 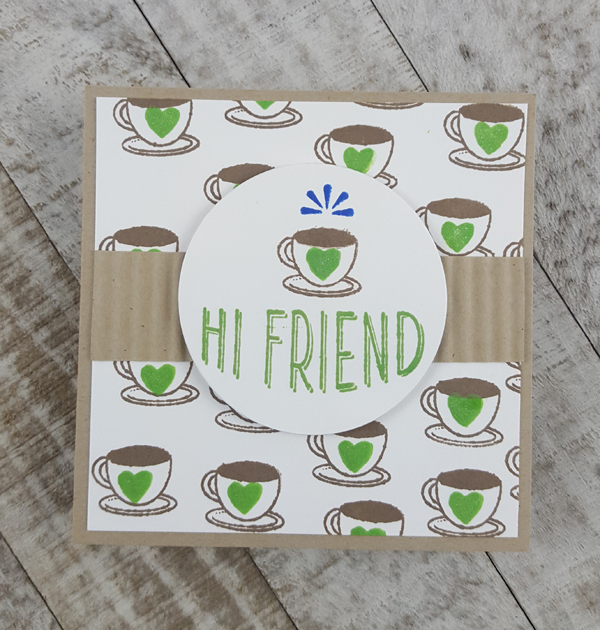 I saw the cute little coffee cup image in the kit stamps, and had to add it to a card! I stamped the coffee cup repeatedly in Cup O' Joe (what else??) ink, then added the heart from the kit in Fresh Lawn. Another optional add-on this month is some gorgeous new Shimmer Spray - I found if I squirted a little onto my craft mat, I could paint it on with a paintbrush! I added it to all of the hearts on the card, because I *heart* shimmer! 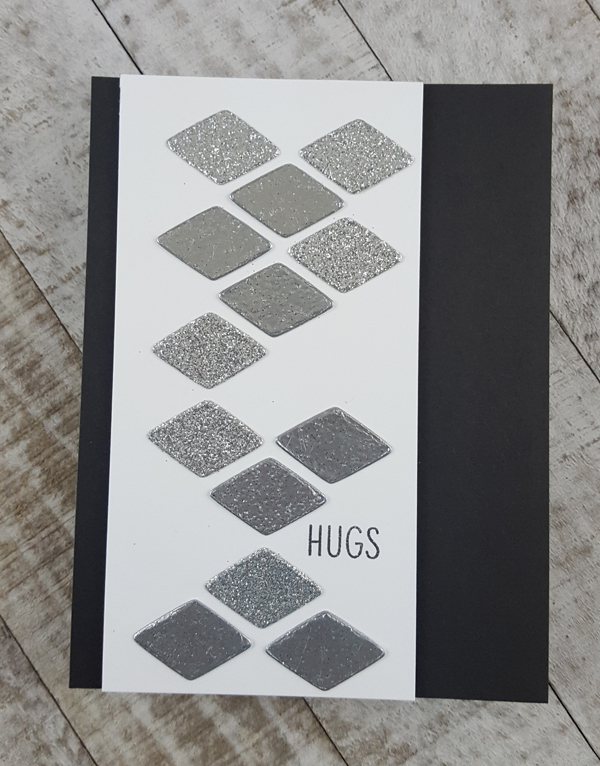 The full kit comes with a variety of useful messages and basic dies that I will use again and again, plus some gorgeous sequins and a new silver sparkle embossing powder! Not to mention a cube of everyone's favorite pigment ink - Unicorn! That's an awful lot of goodness for $34.99! And now it's time to hop! I am the last stop on the hop today, but if you haven't visited the other blogs yet, you'll want to. Hero Arts is giving away one March kit to a lucky reader, picked from the comments left across all blog in the hop! Affiliate links are used at no extra cost to you. Thank you for supporting my blog! Terrific cards, love the backgrounds. Thanks for sharing with us. Love each one of your cards, Libby! this kit is fabulous. Great cards! I like the die used to make a stencil! Great release from Hero Arts. Lots of wonderful, creative cards you made. All your cards are beautiful ! I love the idea to use your "stencil" for a second card. Nothing is wasted and that's great. Great cards! I especially like the one with the coffee cups. I liked your simple cards. I just never seem to do simple. So thanks for sharing these ideas. I love the glittery background on the first one, and what you did with those diamond shaped die cuts is too cool! The coffee card is lovely and the shimmer on the hearts adds just the right touch of shimmery goodness. Libby, your card is fabulous with that background. Love how you add the circle vellum under the sentiment die cut. Great kit and cards! I love how you used the background die as a stencil as well as a die cut. Fantastic cards Libby! 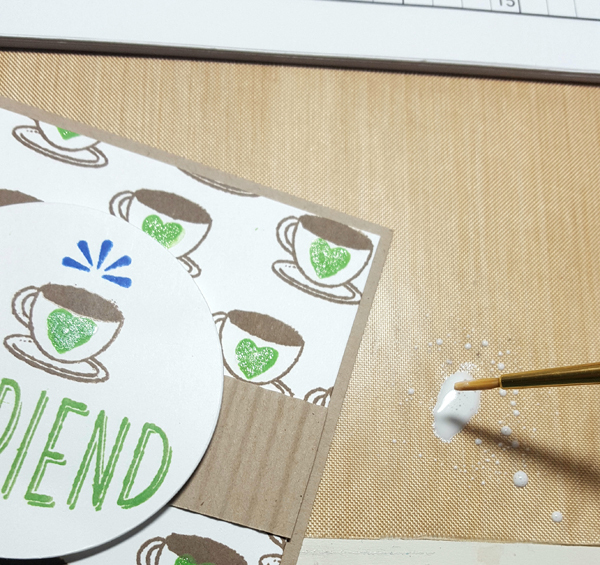 Love that glittery embossing paste! 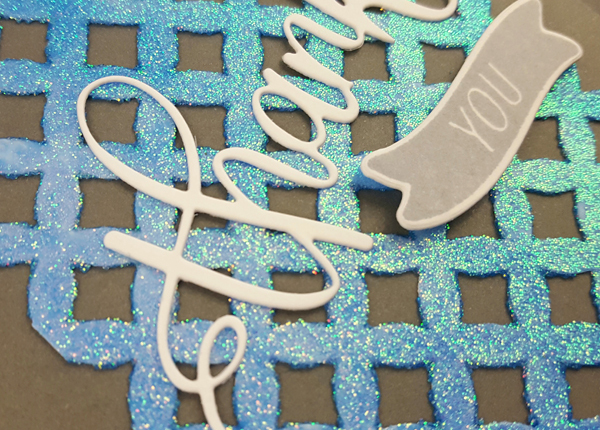 I just love stencils and love that you made one from a die! Love this Hero Arts kit! TFS! These designs are so unique and creative! Thank you for participating in the Hop and for the chance to win! Great cards. Love your multiple uses of the background die. Love how you had the lattace do double duty. cute! These cards are gorgeous and I love them all. Your cards are so fun and creative. Having the right stamps and dies sure helps. I love the inspiration. Lovely cards! I especially like your use of the little diamond die to create an entire card. This kit has great dies! Love how you used the bold graphic confetti die. Fantastic cards! Fun and graphic, love all the shine. A wonderful new release. Great patterns, colors, and design. Just lovely cards. Great cards with such fun ideas! Thanks for sharing with us on this blog hop!! totally love the two textures of your diamond card. great cards. Blue is my favorite color. Pretty cards. Amazed how you thought just to use the diamond shape on a card and made it look great! Lovely work and colours I wouldn't normally use. Thanks for the inspiration. Such great cards. I don't know why, but I have never thought to spray shimmer spray on my craft mat and apply with a brush. So thank you for sharing that wonderful tip! Wow! I'm totally in love for all your stunning and elegant cards!!! Beautiful cards! Loving the stencils! Fun, fun, fun!!! Creative ways to use the Bold Graphic Confetti Die Libby! Thanks for sharing. Awesome cards and so many fun different looks! I love the bling and the variety you have going here. So sad that your blog ends the hop but I think I am full of buckets of inspiration now just in need of my kit. Great cards! Love the sparkle!! Cute cards! Loving that Thank You die. Love love love all the shimmer!!!! Gorgeous cards. Love all that sparkle. Your cards are lovely. So much fun! I love the coffee one. Great cards! I really like the diamond one. Definately need to get some glimmer paste. Beautiful cards! I really love the font on the word dies! Awesome kit! Ooh! I love your cards! Love all the sparkle and shimmer - really brings life to them. Wow, lots of lovely cards, especially the first one with your DIY blue glittery paste! Fantastic cards. I am a "blue" girl too. More great and unique ideas! LOVE IT! Thanks for sharing! Wonderful CAS cards! I love the sparkle you added! Wow, three fabulous cards from this really cool kit, loving the cups card the most, thanks. Ooooh, I like the one with the diamond shape, very nice! Love all the cards but my favourite is the one using the "stencil" you made. Love two for ones!! Great ideas! Beautiful cards. Thank you for sharing your talent! So much sparkle - I'm in love. Beautiful cards! Thanks for sharing all of these great projects--looks like a terrific kit! All your cards are very cute. Thanks for showing the many ways we can use this kit. Great job! You can never go wrong with sparkles! and thank you cards are slowly becoming one of my fav cards to make! Great cards - especially like the coffee one. Thanks for sharing such great inspiration for using this new kit! I love the idea of making a stencil. The glitter look is so pretty, your cards are beautiful. Beautiful cards! I love that you used the bold graphic confetti die as a stencil. And that blue colour you made is gorgeous!! Love it!! I was happy to see that you used the "stencil" to make a card as well. You couldn't throw out all that beautiful glitter!! I also really appreciate how you used so many items from the kit with not much else to make amazing cards. For people that don't have a lot of supplies and only buys the kit (no add-ons) it's nice to see you can make lovely cards just with the kit and a few basic supplies. lovely cards, I like the way you used embossing powder and silver glitter card in the card with the diamond background. Really nice creative cards! I like those little coffee cups all over the card. I too like the tip about the shimmer spray. I have not tried that either. Oh my !! These sparkles are sooo gorgeous !! Your cards are fantastic. I love making backgrounds too. There is so much goodness here! Thank you for sharing and inspiring me. You did such an amazing job on all your cards. I love the mice but I also love the cactus and the eggplants. The eggplant card is so clean and simple but I think it's my favorite.